Email security company Mimecast announced plans to use the symbol “MIME” on the Nasdaq exchange and hopes to raise $100 million in its IPO. 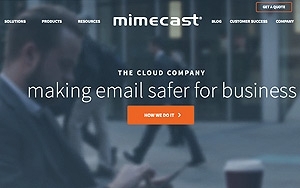 Mimecast provides cloud-based email archiving and security solutions; it claims to protect over 14,500 global customers from targeted attacks, data leaks, malware and spam. Mimecast currently supports three email provider platforms: Office 365, Microsoft Exchange, and Google Apps For Work. Mimecast cited recent data breaches and email phishing attacks in its filing with the US Securities and Exchange Commission on Friday. It should be noted, however, that Mimecast service was disrupted by a cyber attack just last month. The company aims to take advantage of recent high-profile email hacker attacks, which includes today’s allegations that a teenager hacked the personal email accounts of CIA Director John Brennan and Department of Homeland Security Secretary Jeh Johnson. The hacker claims Brennan’s private AOL email account contained sensitive and highly classified material, according to the New York Post. The FBI and Secret Service are reportedly investigating the incident. This comes as Hillary Clinton continues to face scrutiny over her use of a personal email server during her tenure as Secretary of State. The company cites recent Gartner report that say spending in enterprise information and email security is expected to grow to $11.6 billion in 2017. 2014 market spend was estimated to be $9.4 billion. The London-based company bases its U.S. Headquarters in Boston, Massachusetts. Rapid7, another Boston-based cybersecurity firm, went public in July with an offering that raised $103 million.